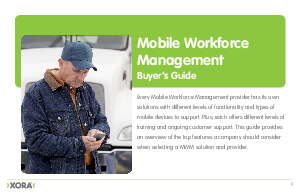 For companies with employees out in the field, Mobile Workforce Management (MWM) solutions offer a great way to manage a mobile workforce. But every MWM provider has its own solutions with different levels of functionality and types of mobile devices to support. Plus, each offers different levels of training and support. This guide provides an overview of the top features a company should consider when selecting a MWM solution and provider. Get practical tips for selecting a Mobile Workforce Management solution that will become indispensable to your business.